There are four primary building blocks to writing a breakout novel—regardless of genre. Bradley P. Beaulieu will walk you through them in this four-week workshop. Writing a breakout novel requires mastery of many key skills. 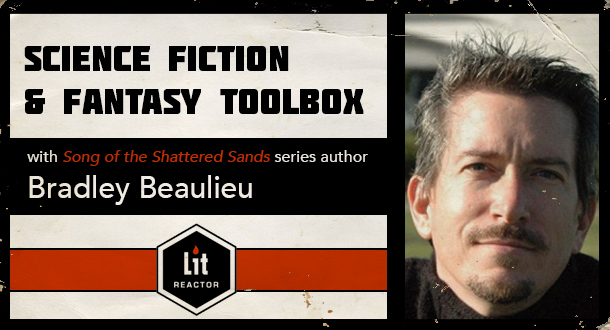 In this four-week workshop, Bradley P. Beaulieu dives into some of the most important: the initial concept, brainstorming, plot development, crating scenes for maximum benefit, and maximizing tension to create the page-turning effect breakout novels are known for. Special attention will be paid not only to the creative side of writing, but also the industry itself: how books are bought and sold, what agents and publishers are looking for, and how to make yourself stand out from the crowd. The class is structured so that the content and assignments build on one another, which allows you to leverage what you've learned in previous weeks and end up with a stronger sense of how to create strong story ideas and build upon that foundation to create fiction that’s compelling, vibrant, and keeps readers coming back for more. Each week’s lecture is presented in both essay form and via YouTube video, so that students can absorb the maximum amount of content for each week’s lecture. The content is presented in such a way that any writer can benefit, regardless of genre, but there is special attention paid to science fiction and fantasy in particular. The workshop will include written assignments, to be critiqued by Bradley and your peers. *Because this class will be running through the holiday season, extra time will be available at the end, in order to give students a little extra time, if necessary. Novels begin with an idea, and the bigger the idea, the more likely you are to attract the notice of agents, editors, and readers. In this seminar, learn techniques that can help you generate your Big Idea from the start, which will help to guide you in writing a novel that will stand out from the crowd. Assignment: Using the snowflake plotting method, develop a one-line synopsis, then one-paragraph, then one-page summary of your book. This can be an existing book or a new one you wish to work on. Plotting is one of the more difficult disciplines to master in writing. Some writers have an innate sense of what makes a story work, but most writers, particularly those early in their apprenticeships, will benefit from plotting. This seminar focuses on various plotting techniques, from basic structural concepts, initial plotting and eventual refinement, how to break the dreaded writer’s block and how to avoid it in the first place. Assignment: Using the techniques discussed, develop the major turning points and ending for your novel, and then plot out to the first major turning point, ending up with roughly a one- to two-page outline of the plot. Well-structured scenes make for compelling storytelling. How can you construct powerful scenes? And how do you string scenes together to create a vivid and stirring piece of writing? In this seminar, you’ll learn how to structure scenes that work, whether you’re writing a short story or the next breakout novel. Assignment: Write the opening scene or one of the early scenes in the novel. Final word count should be 500-2,000 words. Tension is one of the basic building blocks of modern-day fiction. If you know how to lay the seeds of tension, and how to coax them, you can transform your fiction from merely noteworthy to exceptional. In this seminar, the different types of tension are discussed, as well as ways to maximize them to keep your reader glued to the page. Assignment: Revise the scene written in Week 3, paying close attention to the topics discussed. Turn in revised scenes plus a synopsis of what you changed and what you learned from the experience.